How long does it take to Re-Mind Yourself and actually make a change for good? Change can happen in an instant or it can be learned or even forced more slowly. It really depends on you. I’ll bet you’ve heard about studies that show as long as you consciously and consistently do something for roughly 30 days, your change will become automatic. And sure, if you remember to do something long enough your mind and behaviors will adapt and Re-Act automatically in the new way. Change, however, mostly happens much faster than that and often in an instant! Results may not occur overnight…..but the change that leads to the successful results can begin automatically immediately. I was teasing a Type-A girlfriend recently about her rules of the road and specifically that, to her, a yellow light means to drive faster! She surprised me by saying she now slows down when the traffic light turns yellow. A change that she says occurred instantly. About a year ago, she was in a car crumpling wreck at an intersection. Her perception was that the other car came out of nowhere. Truthfully the other driver at the intersection accelerated into her path when his light turned green and my friend hadn’t quite made it through the intersection yet. In the blink of an eye her automatic reaction to a yellow light changed for good…her good and the good of everyone else on the road! She was Re-Minded instantly for a new Re-Action to traffic lights. A spouse can be perfectly content in a relationship but upon discovering an affair can change trust and security into anger, hurt and divorce in a heartbeat. Re-Minded suddenly for a new Re-Action in the relationship. In high school, an inexperienced over-indulgence in vodka martinis turned a fun night with friends into a porcelain hugging nightmare for me. My interest in vodka was turned off overnight! It did take several years and individual experiments with tequila and wine to create a generalization effect and an understanding that my body is easily poisoned by alcohol. Finally, my desire for fermented fruits and grains was tossed down the drain. Experientially I learned to Re-mind myself for a different Re-Action to the offer of a cocktail. Now I easily practice moderation or alcohol abstinence. Twice a year, most Americans change their clocks toward or away from daylight savings time. Most people reluctantly make the change and grumble about it while feeling out of sync for a day or two. But then circadian rhythms reset and things are back to normal in a couple of turns around the sun. Forced Re-Minding for a required Re-Action to life’s reality. Every day we change. It’s the most consistent thing in our lives. We change our minds, change locations, change lanes, change our socks, change our underwear. We do it all the time without thinking about it and without suffering any ill effects. The only thing that makes change slow and difficult is that humans have a tendency to ignore the ease and instead focus attention on grumbling about the least little inconvenience. Giving the pain a voice, giving the pain importance, giving the pain life. I wonder what would happen if your put even as much or better yet more emphasis on what's going right, what's happening easily, noticing how things are becoming more and more automatic. The fact is, you can have a flash of insight “by accident” or in a directed or self-induced hypnotic (trance-formative) state. You can Re-Mind any habit or behavior just as easily as changing from one app to another on your mobile device. Click on your desire and when it opens give it life. Decide on the change to be made. Close your eyes and imagine you’re at a fork in the road. On the left is a road of least resistance. That’s the low road of doing nothing at all to achieve a change. On the right is the high road to success the high road to achieving your goal. Imagine yourself coasting down that low road on the left. Drifting further into the weeds of your habit or behavior. Imagine one year from today down that low road. What do you see, feel, hear, smell, taste after doing the same old thing for a full year? Go to 5 years down that same ole’ road….with 5 years of least resistance….what does that look or feel or sound like? 10 years…one full decade of doing nothing different…..no change. Look in a mirror there….do you feel better…smarter….healthier….happier? That high road on the right is the road to success. It may take a little bit of effort…but head up that road to one year of making the change for good. Imagine you’ve been on a steady path up the road for a full year. What do you see, feel, hear, taste, smell? Go up to the 5 year point on that high road of success….what does that look, feel, sound like? And up to the ten year point of having that old habit or behavior behind you far, far, behind you. Look in the mirror….do you look happier, healthier,smarter, richer, calmer??? Enjoy that success for a moment. Come all the way back to the fork in the road. And now you’re back with your decision to change. Re-Mind Yourself! by noticing your reasons for wanting, needing and desiring this change. 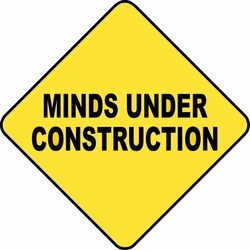 Re-Mind Yourself! about the benefits you will receive from making this change. Imagine you have a snapshot in full color of the you at the ten year point down that low road of avoiding the change. And place that picture in a frame right in front of your face. In your imagination, take in as much as you can about what no change at all looks and feels like down the road. In the upper right hand corner of your visual screen you”ll notice the full color picture of you up there on the high road of successfully having made the chance for a full decade. It’s a little bitty picture up there in the corner……but it’s very important. Now imagine that tiny picture coming toward you getting larger and larger…and overtaking that big picture…pushing it up into the far upper left hand corner of your vision. Bring that little picture forward…pushing that big picture into a tiny little square in the upper left. When the new picture is big and full in front of you, hear it snap into place. And you may notice that old picture…that picture of least resistance creeping back down and overtaking the new big picture. That’s ok…..Let’s bring that tiny picture forward again, faster and snap it into place pushing that old picture out of the way. Snap in the new picture faster…do it again….faster…do it again faster….do it again, faster. And snap that picture of ten years of success into place until it stays bright and secure. And when that happens, you’ll notice that old picture being left behind… fading….fading….fading away until it’s not even there any more. Keep that new future picture snapped into place and keep walking directly toward it every day. Your subconscious mind is already doing everything necessary to work out the steps to get what you want, need and desire in that future you. With every step forward you have a chance to Re-mind Yourself! by noticing how good it feels to be rid of that behavior you left behind. Keep that new future picture snapped into place. Repeat this step as often as necessary to snap your success…your desire…. into place. Walk directly toward that success picture every day. Your subconscious mind is already doing everything necessary to work out the steps to get what you want, need and desire in that future you. With every step forward you have a chance to Re-mind Yourself! by noticing how good it feels to be rid of that behavior you left behind. When you do this self hypnosis technique on a daily routine plus as often as necessary when you need it the most, you will be looking back on a change with amazing results before you even know it! Re-Mind Yourself! And notice how quickly and easily you can change automatic Re-Actions to get the results you most want, need and desire in life.